This species of animal is one of the 50 most threatened species of turtle. 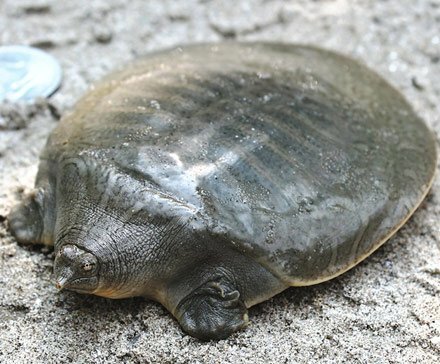 The Yangtze giant soft-shell turtle is a nearly extinct species with only three confirmed members left. One is a geriatric male that is at the Suzhou Shangfangshan Forest Zoo in China. There are two others in the wild, one in the Dong Mo Lake in Vietnam and the other is in Vietnam’s Xuan Khanh Lake. The animal was once a known inhabitant of the Red River in China and Vietnam and from the lower Yangtze River floodplain in China. The loss of wetland habitats to infrastructure development, the damming of rivers, the poaching for meat and eggs as well as the capture for the pet trade have slowly led to the extinction of the species. Due to the secretive nature of this animal, it is unknown whether there are more of this species present in the wild or not. The types of rivers that these turtles inhabit are also complex and it is hard to locate these animals regardless of how hard you try.